Let’s be honest, if you throw some barley and hops into something, we’re most likely to give it a try, but the Samuel Adams Utopias is a different kind of beast. Dropping $150 to $200 on 24 ounces of beer seems a bit ludicrous, but at a world record 27% ABV you have to be getting your money’s worth, right? That being said, I picked up the Utopias at a local liquor store, despite the shuddering of my bank account and chose to suffer this challenge for the benefit of you, the readers. I would like to point out that finding a bottle of Utopias in these parts would be considered a modern day Labor of Hercules, no one was carrying it, and if someone did have it, well they were talking $200. After being shut out of pretty much every reputable liquor store I can think of, I was hit by a proverbial lightning bolt and called upon the liquor store near my office that is best known for selling singles of PBR to the area transients. My thought process being, if they can only afford singles, I doubt they are dropping the cash for the Utopias. On a dusty shelf high above the cash register, there laid my Utopias. I immediately hit the beer forums looking for suggestions on serving and storage. Unlike typical beers, the Utopias can be resealed, and thus does not need to be drunk in one sitting. In fact when the forum thought this was my plan several frantic posts about alcohol poisoning were posted. I mean I’m dumb, but I’m not dumb. Thankfully one of the posters suggested I read the tag on the beer and order the free (+ shipping & handling) Utopias glass that Sam Adams had made especially for the beer. I patiently waited for my glass and once it arrived I looked forward to Saturday. On Saturday I gingerly opened the brew kettle shaped bottle, popped off the underlying cap. A quick whiff of alcohol followed by sugary sweet maple syrup aromas caught my olfactory senses. I nervously poured out 2 ounces of perhaps the most expensive drink ever into my Utopias glass. The absence of carbonation was quite noticeable. The reddish brown liquid filled about a third way up the glass. I lifted the glass to my lips and hesitated. I was 98% scared, 2% excited or maybe the other way around. The beer had stopped me in my tracks and I questioned whether I had put the Utopias too high on the pedestal. My wife eyed me with an air of suspicion with a bit of a grin. She could read my mind and when she saw my expression as I raised the glass and took my first sip, she whooped “You Hate It!” I can only haphazard to guess my expression; I surmise it resembled the look on Roger Rabbit’s face whenever he drank alcohol. My eyes bulged, my nostrils flared, my ears whistled and my bow tie spun. But my wife was wrong. My palette was just not used to the senses I had just inflicted upon myself. The malt, the hops, and the alcohol layered one on top of the other as if it had been put together by one of the Old Masters. The initial taste was like candied dry fruits, prunes, plums and raisins. The alcohol made a fiery passage through the mouth and up into your nose. The bitterness of the hops mimicked the bitterness you’d typically find in a wine as opposed to a beer. The viscosity of the Utopias resembled something too silky to be liquid. And let it be known the beer is GOOD. I spent nearly 40 minutes with my Utopias, taking small sips here and there, in my life I doubt a beer has ever lasted that long once it had reached my clutches; I am not one to nurse a beer. During this time I pondered the rating for the Utopias and it definitely had me twisting and turning. I typically don’t like reviewing beers unless I have had a full 12 ounces to sample, to catch everything in 2 ounces is tough. 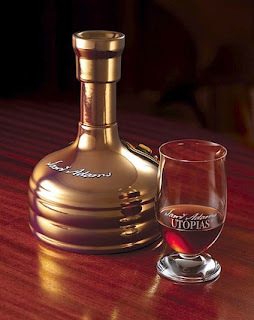 Also I had a hard time thinking about the Utopias as a beer, its more cognac than beer. Alas, I found myself calling this a 4.0. The Utopias I feel is something you have to be in the mood for, and it’s something I feel I will occasionally sip, but only at the right time. Nice review! I once smelled an empty bottle of Utopias during the sam adams brewery tour, and I've always wondered what it tastes like. I hear it makes an excellent going away present for friends moving to distant continents.